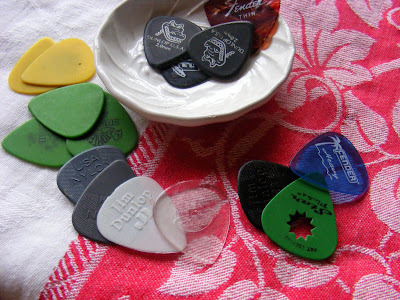 My husband brings home bouncy balls he finds in the resteraunt booths he re-upholsters and oddly enough, he also finds guitar picks in them too. So we have a little dish for them and when he gets home in the morning, he empties his pockets and has a place to put them. They come in handy too. Our son plays the electric guitar and is always needing a pick. Ben: When I'm 18, I can do whatever I want, right? Me: Yes Ben. As long as you don't break the law. Ben: I'm going to move out and you can't come visit me until I tell you you can. Ben: Because I don't want you telling me to clean up or what to eat. Me: I still can do that because I'm the mom and mom's can always do that. Ben: But you can't tell me that when I'm moved out. Me: Yes I can. I'm the mom. Me: You know that when you move out, you're going to have to pay rent and pay for food and pay for light & water. Me: Yes you do. When you move out, you have to pay for all your own bills. Ben: Fine. I'll play my guitar in a band to make money. Me: Okay. You can do that but you better practice more so you can be really good and someone will hire you to be in their band.